TEXTILE.PRINTING is applied on a large variety of different textile substrates, and for an even wider range of user purposes. The applied printing technology needs to be adapted to the needs of each and every special product. For this reason we have split the applications into a variety of products and according to their final purposes. "Home Textiles" is a collective term for all kinds of fabrics used for home furnishing and home decoration. The product range includes cover sheets, upholstery, decorative fabrics, shower curtains, window fashion, terry towel fabrics and many more. Such a wide field of applications needs a variety of machines with most flexible set-up options. Home textiles are fabricated not only from native fibers such as Cotton, Linen and Viscose, but also form artificial fibers such as Polyamide and Polyester. Contract fabrics count among the home textiles range, but they have special needs in regards of fastness, durability and safety standards. 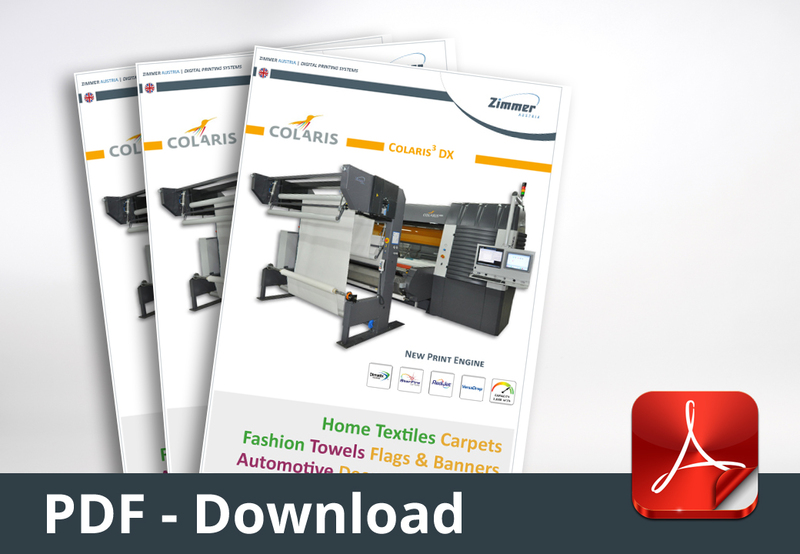 Our range of machines for printing and finishing all these kinds of fabrics offers individual layout and flexibility, including various line components and ink combinations for highly-economic production. ZIMMER AUSTRIA can offer customized solutions for the most economical printing and finishing of any kind of Home Textile substrate. Modular design enables the integration of additional line components: Starting with a stand-alone printer, the integration of existing equipment at the customer's site or adding third-party line components for an economic layout is daily routine for ZIMMER AUSTRIA. Technology-oriented selection of line components, in combination with the COLARIS.TEXTILE platform, is the basis for printing and finishing plants to cover fashion fabrics, bed sheets, decorative and upholstery substrates, terry towels, fleece and blanket fabrics, window fashion and outdoor fabrics incl. camping and awnings. 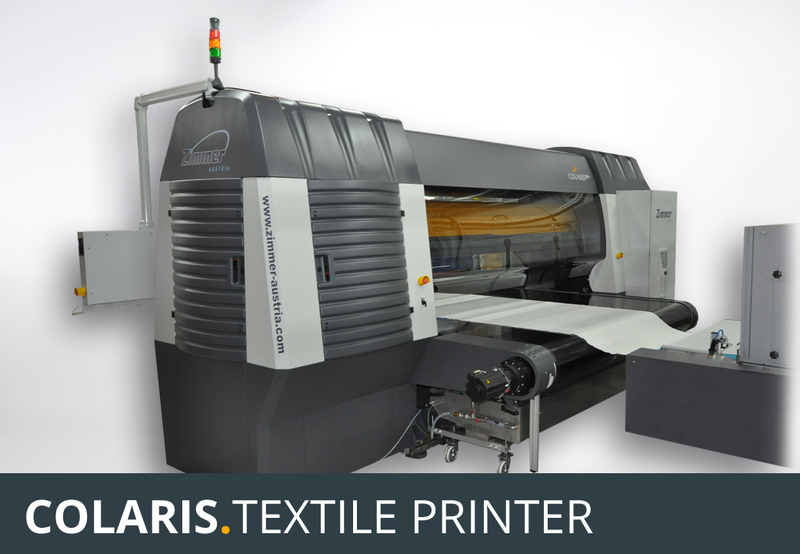 The same COLARIS.TEXTILE platform is used to integrate any equipment needed to achieve even a carpet printing and finishing line. The availability of four different print head configurations is the basis to cover such a range of applications. The printer may be equipped with any of the four versions of FUJIFILM Dimatix StarFire™ print heads. They provide a droplet size range from 12 through 180 pl, accurately tuned to the needs of any customer. Engineering and system integration is offered by ZIMMER AUSTRIA specialists exclusively. Available working widths: 1,800, 2,600 or 3,200 mm. Colors: 4, 6 or 8 different colors are available. Layout with up to 64 print heads; various combinations such as CMYK only, double CMYK, CMYK plus additional process colors, or CMYK with diluents etc. can be selected. For special needs, ZIMMER AUSTRIA also offers a 12-color setup, with up to 96 print heads. Available layouts are double-6 colors setup, or even a combination of 8 reactive ink colors plus 4 disperse ink colorss, or any other combination like 6 pigment colors plus 6 VAT color inks for high light fastness printing onto cellulose fabrics.